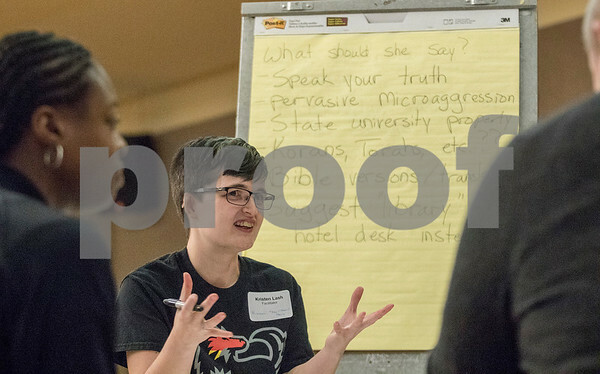 NIU group facilitator Kristen Lash, who works as a library specialist at NIU helps her group's discussion during the "Allies in Interfaith" Diversity Dialogue at Northern Illinois University in the Regency Room at the Holmes Student Center on Thursday, April 21, 2016. This dialogue focused on interfaith inclusion as well as LGBTQ inclusion and how both combine in communities. Lash identifies as trans non-binary and is also a member of Westminster Presbyterian Church in DeKalb.